Rising waters have breached levees along the Missouri River. 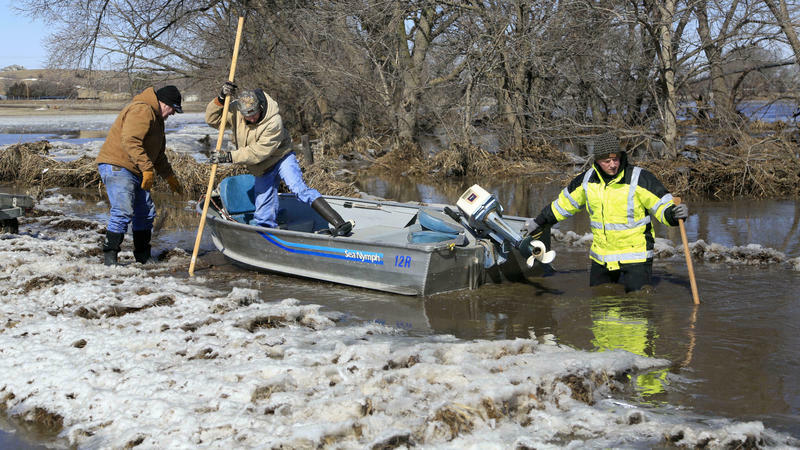 The Doniphan County Fire Chief monitored the levee near St. Joseph through Tuesday night. Hall said he worries this could crush the local economy. "It's going to scare a lot of people. A lot of people probably won't come back," he said. Hall has been in the area for 40 years and seen two major floods, one in 1993 and another in 2011. He said he thinks this one could have been prevented. "My opinion is the government's wasting too much money. They should already have this fixed. I mean, '93? Come on," Hall said. "Once that river gets down they need to open the floodgates up [north] and let the river flow naturally, and quit trying to control nature." 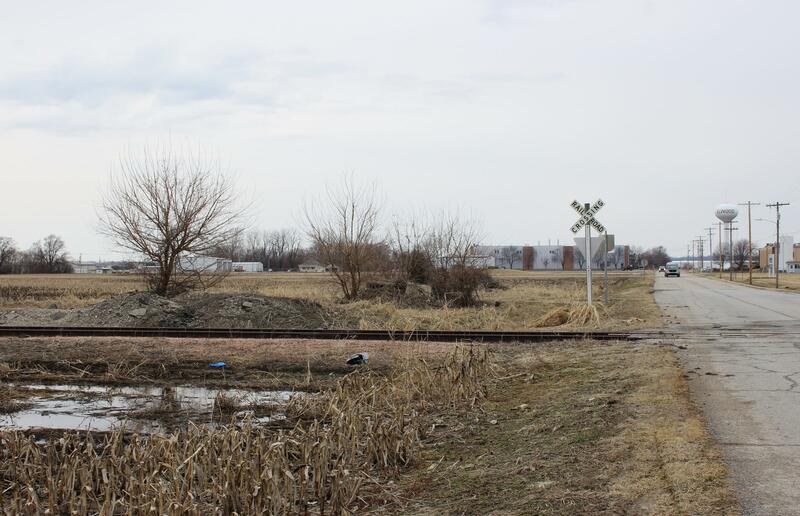 Others said they felt that flood control and the town of Elwood was last on the mind of government officials. Even about a mile from the Missouri River in Elwood, Kansas, the ground is saturated with water. That's why officials are encouraging all residents to leave if possible ahead of the river's crest, predicted to reach 29 feet Thursday. 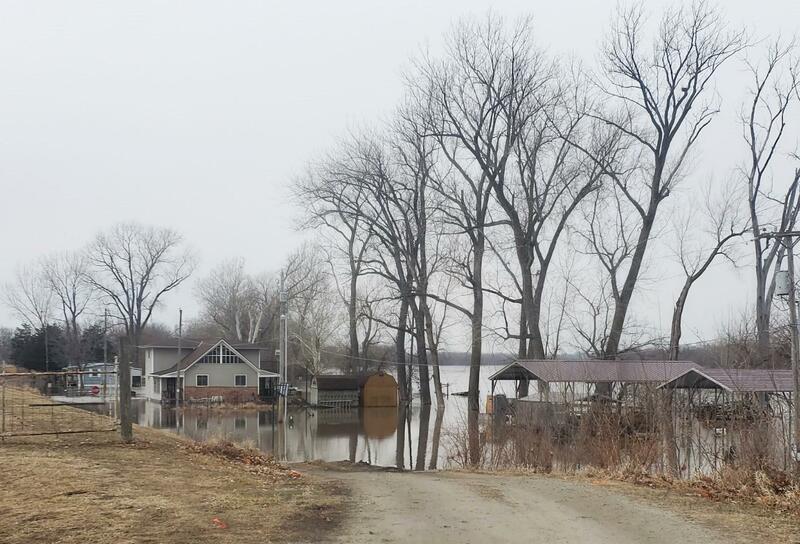 Kansas Governor Laura Kelly issued a state of disaster emergency declaration for Doniphan County Monday, and many residents and businesses closest to the river had vacated by Tuesday. Breanna Rosene, 23, lives in a trailer park off of Highway 36 with her 9-month-old daughter Zoraya. She said at least five of her neighbors left in U-Hauls over the weekend. Rosene focused on moving out all the belongings she says will be too expensive to replace, first. "In case we do lose our home, we're going to have to use all our money towards a new home. We're just waiting for the mandatory evacuation, really," Rosene said. The owners of Zimmerman Motors moved their cars and equipment into storage over in St. Joseph over the weekend. Manager Lacy Hargrave said they didn't want to take any chances, but it's not great for business. "We don't have any cars here to sell, so we're just twiddling our thumbs trying to wait it out," Hargrave said. Tuesday morning, the home of Lacy Hargrave's neighbor near Lake Contrary in St. Joseph was surrounded by water. Hargrave lives across the river near Lake Contrary in St. Joseph. Her neighbor's house was surrounded by water Tuesday morning. She said she saw a lot of levee work and sandbags going in near her house. She hadn't vacated Tuesday but said she was beginning to wonder if she should. North along the river, her family's home was destroyed by the flooding Friday. Since then, I-29 has been shut down, and volunteers in St. Joseph and Elwood made more than 100,000 sandbags to help reinforce levees. Though Doniphan County officials have recommended residents leave, they have not issued a mandatory evacuation. Just northwest of Doniphan, the Holt County sheriff issued a mandatory evacuation for the 220 residents of Craig, Missouri, Tuesday night. Some homes there have reportedly seen 7 feet of water. While many eyes remain on recovery and damage assessment in Texas and Louisiana in the literal wake of Hurricane Harvey, some residents of the Kansas City metro — who've seen unusual amounts of rainfall and dangerous flooding this summer — are growing more concerned about the possibility of unprecedented floods.